The SubSat-15sp set consists of two Modular-15sp, two Subhorn-115sp and two Subhorn-115. The SubSat-15sp set consists of two Modular-15sp, two Subhorn-115sp and two Subhorn-115. It is possible to connect another two Modular-15 bi-amping from the self-powered model. One Subhorn-115sp powered a second Subhorn. There are still 4 x 800 W channels free and available on the self-powered subwoofers. These channels can be used for flexible monitors, nearfills, delay lines or zoning. The SubSat-15sp set offers a ‘not-yet-achieved’ performance in this class. The high efficiency of the speakers, in conjunction with the internal high powered amplifier modules (together 14.400 W), achieves a sound pressure which previously could only be obtained with considerably larger systems. 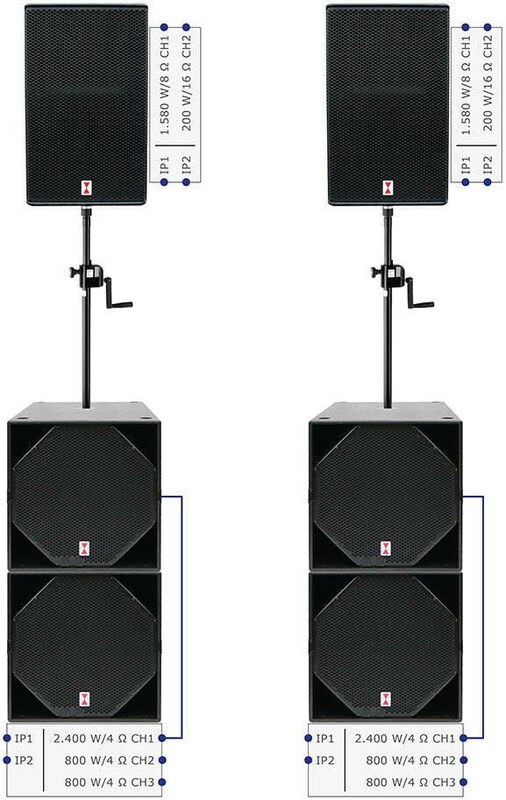 This system has enough power for use in small venues and can also achieve an excellent acoustic irradiation of events consisting of several hundred people. It is possible to use only single components from these set. 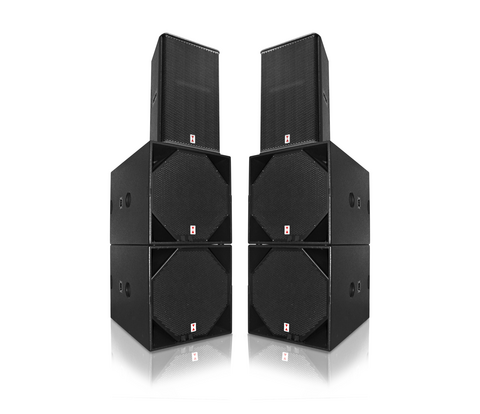 For example the Modular-15sp only stand alone as fullrange speaker or with one or two subs. The user is very flexible. The SubSat-15sp set sounds balanced at all volume levels: powerful, transparent and fine resolution. Speech intelligibility is also perfect at a long distance. Both speech and vocals are clear and understandable in larger and rectangular spaces. The concept of the SubSat-15sp set convinced: an easy transport, fast built up, minimum wiring expenditure, optimum operational safety. The system is to be used plug&play, connect cable and start performance. All components are tuned on each other and work about the integrated loudspeaker management system (DSP) very safe and with optimal programmed presets. Your sound is excellent from the beginning without too must be operate a potentiometer. Experienced technicians and professional audio operator can still alter the functions and have access capabilities to the DSP settings. Access to almost all parameters without PC control can be made using the display buttons and encoder wheel. The functions can be password protected obviating unauthorized interference. Complex configurations can be comfortably created via the Ethernet, USB, or an optional integrated bi-directional wireless interface on the PC surface, using the VA-WLAN remote software for PC and Mac. Individual sound ideas and alterations can be saved as presets and recalled at any time. The internal electronic is convection-cooled without fan and maintenance-free. In the Modular-15sp work a two channel amplifier modul. The speaker is powered bi-amping. 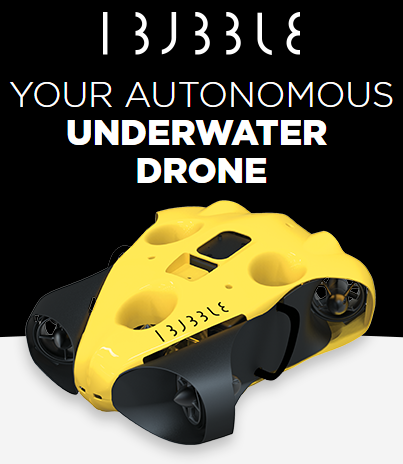 It is possible to switch the directivity of the Modular-15. There are different and rotable horns with identical dimension available: 60 x 40° or 90 x 50° directivity. In the internal dsp-board is for each horn directivity some own different presets programmed. The user can work with the optimal directivity for each job to sounding the public area exact with direct sound and less room reflection. Special emphasis has been placed on an even and clean coverage of the Modular-15. The top unit is designed so that the frequency response is linear and without constrictions even outside the main axis of radiation. The sound is thus almost identical anywhere in front of the speaker. The patented array design of the tops heads minimizes interference between the sound sources. Two or more systems can also provide a great combined PA. This multiple usage factor provides the user with an even wider range with only one speaker system. The possible extensions, scaling, ease of use, and extensive utilitarian accessories, complete the SubSat-15sp set and make it a universal PA tool. On request, can be replaced by the Paveosub-118/118sp all Subhorn-115/115sp.